There are a few products that can be used as an alternative for soap for eczema, that help to keep the moisture in the skin. Regular mass produced soaps can be very damaging on your skin. They dry the skin out, making it less flexible and more prone to irritation and infection. Bath additives are used instead of bubble bath. They normally contain fragrances, so can be an irritant. Bubble baths also contain soap. Soap removes the natural oils of the skin, drying out the skin. Even if a bath additive is used, a cream, ointment or lotion should be applied after bathing. They are best applied when the skin is still damp. This helps them to absorb easier and prevent the skin losing more moisture. Some creams and ointments can be used in the bath and as soap substitutes. The ones that can be used are the water soluble ones. One word of warning when using an emollient in the bath is that they can make the bath very slippery. Take care if the bath is for your child or someone elderly. It may be a good idea to use a non slip bath map. It is fragrance free and dissolves nicely in the bath. Add to a bath of warm water. Add half/one capful to a bath for children, and one/two capfuls for adults. It can also be applied to wet skin before showering. Apply lightly with a wet sponge. It is fragrance free and colourant free. Soap substitutes are great as soap for eczema. These are recommended to use instead of soap. Whether you use a bar or liquid, these substitutes help replace the skin's natural oils. Most mass produced soaps contain detergents that rip these oils away. Soap substitutes don’t lather, but bubbles aren’t necessary to keep our skin clean. You can buy specially made bars or liquid to use. Or use one of the emollient creams or ointments that are suitable. Oilatum do a bar of soap for sensitive skin. It comes as a 100g bar. It is more expensive than normal soap but a great deal better for your skin. Its active ingredient – Liquid Paraffin BP 7.5%. It does contain fragrance, so again if you have any irritation stop use. Cetaphil produce Gentle Skin Cleanser and Doublebase produce Emollient Shower Gel. 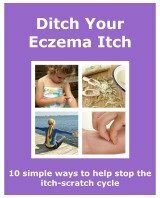 You can read more about Eczema Moisturizers and what type may be the best one to use for your skin.